In his outstanding book, “Cholas” , Sri Neelakanda Sastri says, ” From the Tenth Century A.D., the period of Chola rule was a great epoch in the building of structural stone Temples. The walls of the new Temples, their pillairs and plinths were usually covered with inscriptions in course of time. We are expressly told that before old structures were pulled down for rebuilding a shrine, the inscriptions on the walls , in many cases copied out in books and re-engraved later on the walls of the new structure.Even brick Temples had,sometimes, some inscriptionsengraved on their walls. We shall never know the extent of damage inflicted in recent years by the ignorant piety of renovators of ancient shrines. Government have been unduly slack in stopping such damage ; they have even refused to lay down a procedure to be followed by renovators which would have minimised the extent of the damage. ” This call seems to have been put in the back burner as neither the Government nor the renovators pay enough attention to preserve the inscriptions on the old structures. Be it a painting or an inscription , the irrepairable damage is being caused in many Temples. What’s more! A recent Newspaper report says that the ASI has “lost” many archaeological sites. Even the places where the inscriptions had been documented earlier are not looked after properly to see the present condition. Proper guidelines are yet to be framed and monitored to prevent destruction in the future. It is true that some awareness has been created due to which the renovators pull down the structures only after numbering the stones. Once the weeds and Trees are removed from the joints, the structure is re built as guided by the numbering system. In the absence of such a system, we find that the inscriptions are misplaced and the continuity is lost. With the view to halt any further damage, there are some renovators who avoid painting on granite walls and never indulge in disturbing the old paintings on the walls. 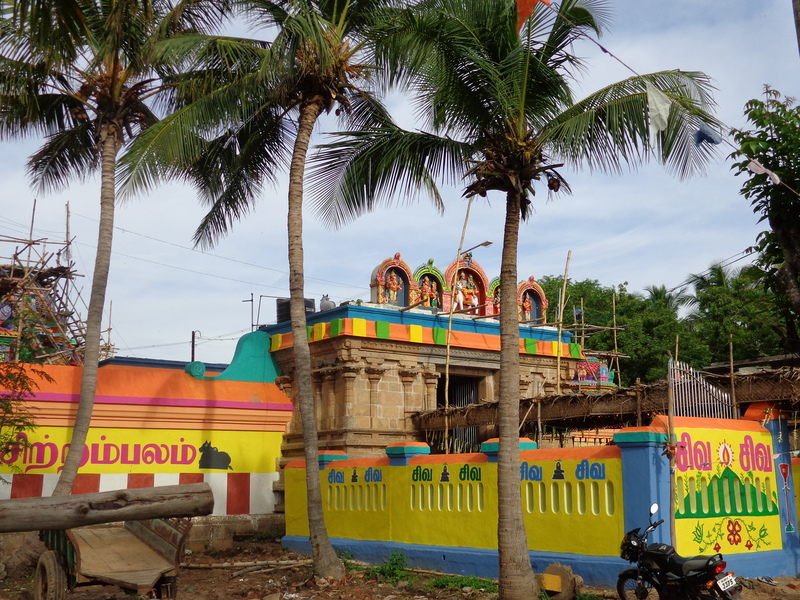 One such Temple is at Manakkal, 6 Km away from Thiruvarur. When our Sabha joined the renovation work with other renovators, it was decided not to touch the century old paintings. The wall around the Sanctum that contains the inscriptions were not painted. Hence the painting was done only for the brick vimanams and new structures. The Main entrance was without Raja Gopuram. The only addtion to this is the arrival of “Pancha Murthis” with bulls on both sides . This arrangement is seen in many Temples (such as Kudavasal, Nalur Mayanam,Thalayalangadu of this region)where there is no Rajagopuram at the Main Entrance. The Priority was to retain the century old Painting as such as it was feared any repainting would change the original look. The Dwarapalaka/Dwarapalikas Paintings at the entrance of the Swami & Ambal Sannadhis were given background painting in order to boost the original image. It is surprising to see that the figures drawn with ordinary colour powders have stood for many decades. The top panel at Swami & Ambal shrines has the figures of Somaskanda,Gaja Lakshmi ,brilliantly painted. The Nataraja painting at the Mahamandapam is done marvellously. The Lord is seen performing Ananada Thandavam. Sivakama sundari is standing nearby and the Rishis, Pathajali & Vyagrapatha with folded hands on both sides. To the rightside of the painting is another one with the figures of Saivaite Acharyas and Sekkizhar and to the left side, Agasthya Muni is seen worshipping a Shiva Linga. The whole set of painting is left as before and only the background color is introduced with great care. New Shrines were built in the outer Prakara to house the Murthis of Ganapathi and Subramanya with Mahamandapam in the front. The construction of the shrine is shown here with pictures taken at different stages. Yagasalai was raised in front of the Temple and five Kundams each for Swami and Ambal were constructed. Separate Kundams for Ganapathi,Subramanya and other Murthis were also constructed. Ganapathi Homam , Navagraha Homam ,Dhana Poojai, Pravesa Bali,Rakshogna Homam and Vasthu santhi were performed in liew of the Maha Kumbabhishekam. Holy water was brought from Vettar, a branch of Cauvery and Angurarpanam was performed on the first day morning. After performing Rakshabhandhanam,grahapreethi etc kalakarshanam , a ceremony to transfer Power of the Murthis into Holy water contained in New Vessels was done as per Sivagamas. Kala Pooja was carried out for four times at the Yagasala prior to Kumbabhishekam. Among the various events, speciall mention has to be made to Visesha Sandhi , Brahmachari Puja, Lakshmi Pooja, Dhampathi Pooja,Suvasini Puja,Kannika Puja which were done meticulously. 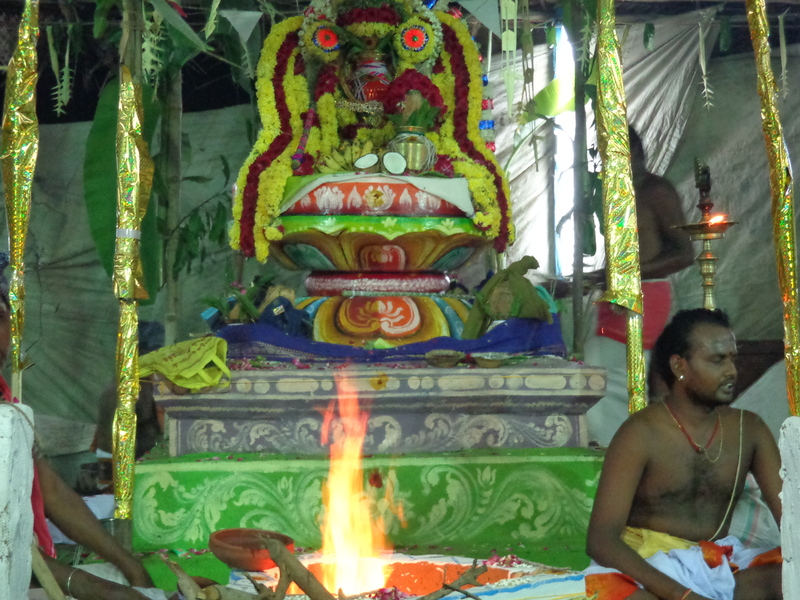 Ashtabandhanam was prepared and applied at the Pedastal of all Murthis during 3rd Kala Puja. All credit should be given to the Sthapathi who applied the Ashtabandhanam so well. The Temple took a grand festive look right from the early hours of Sunday, 15th Sept 2013. People who waited so long for the memorable event to happen arrived in big numbers. Poornahudhi was performed at the Yagasala around 8. 30 A.M. and the Kalasams were taken in a Procession around the Temple and reached the top of each sannadhi. Holy water was poured over all Kalasams sharply at 10. 30 A.M. watched by hundreds of devotees. “Thiru Kalyanam” was performed in the evening which was witnessed by a large number of devotees. Although the locals pay rich tribute to the service of our Sabha, it was only because of the hard work and cooperation of the locals, the dream-event became possible. Many of them postponed their personal work and stayed back in the Temple to arrange everything as prescribed. Our gratitude also goes to the team of Sivacharyars who performed the event to the great satisfaction of everyone. Veda Parayanam and Thirumurai Parayanam were held as a part of the mega event. Oduva Murthis explained the significance of the event and gave details of Panns and the greatness of Thirumurais. Our Sabha has kept an inscription at the Mahamandapam which records the date of the grand event along with Appar’s Thevaram Hymn that mentions the name of this place. While thanking the locals, we expressed our opinion that the event was only a beginning and a lot remains to done in the future for upkeeping and developing the Temple. The message was well received by them with a vow to preserve the ancient Shrine in a best possible manner.